Shop for authentic Pennsylvania Flags. We offer indoor and outdoor Pennsylvania flags in durable nylon. Our outdoor flags are finished with a canvas heading, while indoor flags are finished with a lined pole hem and your choice of with or without fringe. 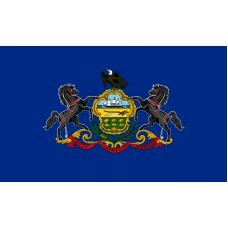 We also offer indoor and outdoor Pennsylvania flag sets. The state of Pennsylvania is actually called the Commonwealth of Pennsylvania. 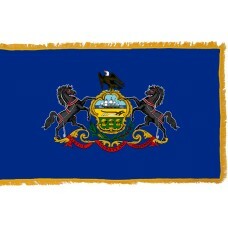 Its flag has a deep blue background with the Pennsylvania coat of arms at the center. This consists of a central shield on top of which sits an American Bald Eagle, and whose sides are supported by two black horses. The eagle is a symbol of Pennsylvania's allegiance to the USA. On the shield itself are symbols of the state's prized resources. These are a sailing ship, a plow, and three sheaves of wheat. Under the shield are an olive branch and a corn stalk, representing peace and prosperity. A banner bearing the words "virtue, liberty and independence" is draped under the shield. The Pennsylvania State Flag is one of the oldest in the Union, having been adopted in 1778. Although it has seen some modifications since then, the coat of arms and the flag are basically that of a design by Caleb Townes. Townes was a Quaker from Philadelphia with strong links to William Penn, son of the founder of the Commonwealth of Pennsylvania. Penn was a Quaker like his father, who obtained the land which is now Pennsylvania from the British crown. Pennsylvania is dominated by the north-eastern end of the Appalachian Mountain range. This divides the state markedly between the north west and south east of the range. The mountains themselves make up a huge part of the state. Pennsylvania is located in both the Northeastern and Mid-Atlantic regions of the USA. It has coastline on Lake Erie (therefore Canada), and is bounded to the north and east by New York and New Jersey, across the Delaware River. Philadelphia, the state's largest city, is at the south-eastern tip of the state, on the Delaware River. The Capital, Harrisburg, lies inland to the west. The Mason Dixon line separates the state from Maryland and West Virginia. Ohio lies to the west. Pennsylvania is one of the 13 founding states of the USA. It lies across land which was disputed between the British and the Dutch in the 17th Century, when these empires where claiming land and settlements such as New Amsterdam, which became New York. It was highly valued for its natural resources, not least its forests. Eventually the Commonwealth was settled by the Penna, who were Quakers. Later economic development included coalmining, steelmaking and shipbuilding. The state has stunning scenery, dominated by the Appalachian Mountains.